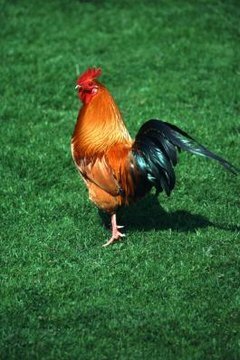 Roosters are territorial and can be aggressive with both humans and other chickens. If you intend to introduce a new rooster to your existing flock, you will need to plan ahead and take special precautions to prevent possible fights and injuries from occurring. The amount of success you have introducing a new rooster to your flock will depend on the ages and personalities of your birds. It's a bad idea to go buy an adult rooster and just toss him into the coop with your hens. Your chicken flock has a pecking order, meaning that some birds are more dominant than others in the flock. Roosters are normally near the top, if not at the very top, of a flock's pecking order. This means that a new rooster will need to prove himself to both the hens and any other roosters in the flock to determine where his place in your flock will be. Because roosters can be aggressive, you need to plan how you will introduce your new rooster to your existing flock. Remember that a young rooster, or cockerel, will be much easier to introduce to a flock than a mature adult. You should keep a new rooster separate from your existing flock for a couple of weeks before you think about putting him in with the flock. This waiting period allows you to see any health issues he might have and gives you plenty of time to get a handle on his temperament. Take your time getting to know your new rooster and allow him to get to know you. He will be easier to deal with within your flock if you understand how to handle him in a one-on-one setting. You can allow your new rooster to get used to his future flock by placing him in a separate pen within your flock's living enclosure. The pen will allow your rooster to see the other birds and lets your other chickens check out your rooster without risk of any of the birds injuring one another. It is especially useful to watch these interactions and identify any birds who seem particularly aggressive toward the newcomer or vice versa. When you think your new rooster has become reasonably acclimated to his new flock mates, you can allow him out of the pen and into the main coop. Expect your new rooster to get into a few squabbles with his new flock during the first couple of days he lives among your existing birds. As long as the fighting is not prolonged and no birds are seriously injured, you should allow them to sort out their own pecking order without your interference. Provide plenty of feed and scratch to keep all the birds occupied as they acclimate to one another. Birds who fight with one another on multiple occasions or who injure one another will need to be separated from the flock. Some roosters, and even very dominant hens, simply will not learn to get along and cannot be kept together.